Exciting news—our automatic washing machine is up and running in our laundry. For the 42 years the hospital has been functioning we have always had people scrub all the laundry by hand! 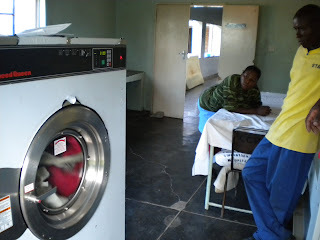 Through the generous donations of the Mick family in the US, Australian Rotary and numerous donors in the UK, we were able to purchase a washing machine in South Africa as well as a pressing machine. We recently had the electricians and plumbers out to hook it up and yesterday we finally had electricity and ran 3 loads in a row! Wow the workers were so happy! We did all the laundry they take 2 days to do in 3 hours! PTL for all the donors that made this possible! 2010Major and I flew to Victoria Falls on January 26th and spent 3 days visiting with an alumnus of Chidamoyo, Cindy Kaess. Cindy came with a group from Adventure Christian Church in Roseville, CA during the summer of 2003. She also works at Sutter Memorial Hospital in Sacramento, CA where I started my nursing career. We have many friends in common who live and work there. Cindy came with her mom Barbara, sister, Catherine, and group of 23 other people from the US and Canada who were touring South Africa, Victoria Falls and Botswana. So we were fortunate to fly down and spend the 3 days they were in Victoria Falls with them. We walked the Falls, shopped, bartered, walked in the rain and ate Mopani worms at the Boma Restaurant with them! 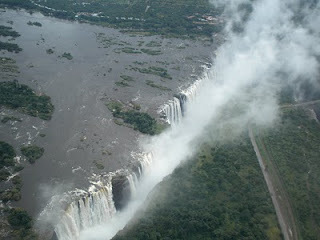 They also paid for Major and I to fly over Victoria Falls in a helicopter—a first for Major to be in a helicopter! He was so excited!